My cousin Barrie Jones (b 1945) is front left, with Christopher Church and Michael (surname forgotten). The photograph will have been taken in the early 1950s, at a district event held at Ralli Hall, Denmark Villas, Hove. Do you recognise yourself or anyone else here? Were you a member of the Scouts at this time. Please share your memories with us by posting a comment below. Barrie lived, I think, at No 2 Godwin Road below where I lived at No 12. If I am right Christopher Church lived at the top end of Godwin Road with Mr and Mrs Clapson who either fostered or adopted him. If my memory is right he took the name of ‘Church’ because he was found abandoned on the steps of a Church. Yes Ian, that’s pretty much word for word what Barrie told me last week. I was in 5th Hove Cubs and Scouts and was born in 1946, so I guess I would have started Cubs about 1955 or 56. Only the Cubs you describe were in the 5th Hove pack, all the Scouts appear to be from different packs. I’m afraid I don’t recognise any names, but we did have gang shows etc. in the Ralli Hall. I wonder why there are only three from the 5th Hove pack pictured. Maybe the rest are on the stage. There are just three cubs there because they’d won an award, and were there for the presentation. 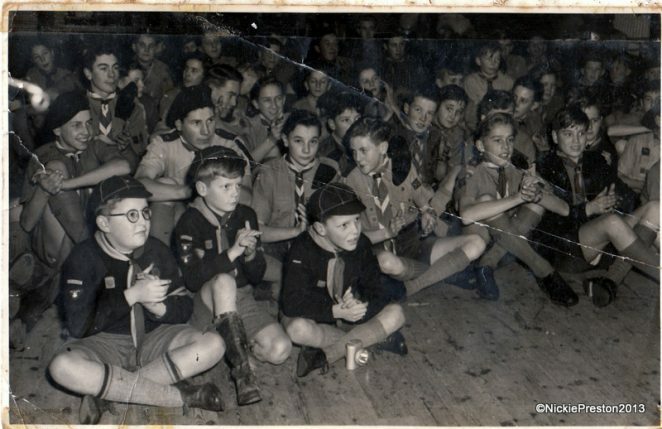 I was in the 5th Hove Cubs and we initially meet in a wooden building behind Martin Road, Hove. Later, a new “Scout Hut” was built behind flats in Hangleton Road, Hove/ at the top of Stapley Road, Hove. The “opening”, in about 1956, was a grand affair which I attended. I was a cub there in the 1950s but the only other boy I can remember is Keith Botting.